The timed-sequential chemotherapy regimen consisting of etoposide, mitoxantrone and cytarabine (EMA) is an effective therapy for relapsed or refractory acute myelogenous leukemia (AML). We postulated that granulocyte colony-stimulating factor (G-CSF) might enhance the cytotoxicity of EMA by increasing the proportion of leukemic blasts in S-phase. We added G-CSF to EMA (EMA-G) for therapy of advanced high-risk AML patients. High-risk AML was defined as refractory, relapsed or secondary to either an antecedent hematologic disorder or exposure to cytotoxic agents. The patients were treated with one course of EMA-G consisting of mitoxantrone and cytarabine on days 1–3, and etoposide and cytarabine on days 8–10. G-CSF was started on day 4 and continued until absolute neutrophil count recovered. Thirty patients were enrolled. The median age was 51 years (range, 25–75). Seventeen (61%) patients had unfavorable cytogenetic karyotypes. Twenty (69%) patients had secondary AML. Ten (34%) had relapsed disease. Four (14%) had refractory AML. Three (10%) patients died from febrile neutropenia and sepsis. Major non-hematologic toxicity included hyperbilirubimenia, renal insufficiency, mucositis, diarrhea, nausea and vomiting, skin rash. A complete remission was achieved in 13 (46%) patients. Median overall survival was 9 months (range, 0.5–66). Median relapse-free survival (RFS) for those who had a CR was 3 months (range, 0.5–63) with RFS censored at the time of allogeneic bone marrow transplantation or peripheral stem cell transplantation for 6 of the patients. EMA-G is a safe and efficacious option for induction chemotherapy in advanced, high-risk AML patients. The activity of EMA may be increased if applied in patients with less advanced disease. The combination of timed sequential chemotherapy and hematopoietic growth factors allows for an initial cytoreductive course of chemotherapy before starting growth factors. The growth factor could then work with the other "humoral factors" generated by chemotherapy to maximize recruitment of leukemic blasts into cell cycle. Few studies have tested this approach. We report the results of a clinical trial assessing the potential benefit of adding G-CSF to a proven timed sequential chemotherapeutic regimen. All patients had AML defined according to the standard French-American-British (FAB) cytologic and cytochemical criteria . Patients were considered to have good-risk cytogenetics if their karyotype revealed either t(8;21), inv(16), t(16;16) or t(15:17). A normal karyotype defined intermediate-risk cytogenetics. All other clonal abnormalities were considered poor-risk. Patients were eligible for this protocol if their leukemia was: 1) refractory to previous induction chemotherapy, 2) in first or subsequent relapse after initial complete remission following induction chemotherapy, 3) secondary to transformation from an antecedent hematologic disorder, or 4) secondary to previous exposure to cytotoxic agents. All patients were over 18 years of age. Only patients with a performance status of 2 or less and no organ failure [less than grade 2 according to the World Health Organization (WHO) grading system] could enter the study, except if organ failure was related to the leukemia itself. Patients with leukemic meningitis were excluded. All patients gave signed informed consent and were treated on clinical protocols approved by the Cleveland Clinic Foundation's Institutional Review Board. The EMA regimen contains etoposide, mitoxantrone and cytarabine administered in a timed-sequential fashion. 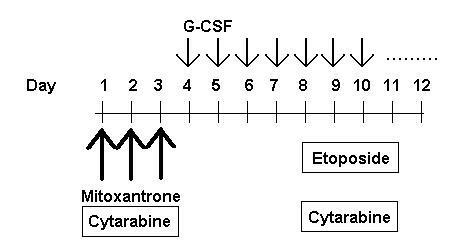 We added G-CSF to the EMA regimen, thus EMA-G. EMA-G consists of mitoxantrone 12 mg/m2 per day intravenous (IV) bolus for 3 days (day 1 to 3) with cytarabine 500 mg/m2 per day IV continuous infusion (CI) for 72 hours (day 1 to 3). Etoposide 200 mg/m2 per day IVCI for 72 hours and cytarabine 500 mg/m2 per day IVCI for 72 hours were administered on day 8 to 10. G-CSF 5 mg/kg per day subcutaneouly was started on day 4 and continued until the absolute neutrophil count (ANC) rose above 0.5 × 109/L for two consecutive days (Fig. 1). Only one course of EMA-G induction was given. Post remission therapy included chemotherapy, allogeneic bone marrow transplantation (BMT) or peripheral stem cell transplantation (PSCT) at the treating physician's discretion and availability of a transplant donor. All patients were cared for in semi-private rooms supplied with HEPA filters on a regular oncology unit. All patients received standard supportive care including blood component support for severe cytopenias as previously described. Acyclovir 250 mg/m2 per day IV or 400–800 mg PO bid, allopurinol 300 mg PO qd and fluconazole 400 mg PO qd were administered prophylactically. Bone marrow aspirates and biopsies were obtained on day 8 of chemotherapy and then at the discretion of the treating physicians. When a bone marrow aspirate or biopsy obtained on or after Day 14 contained 5% or more blast cells, G-CSF was stopped. Complete remission (CR) was achieved when the following parameters were met: 1) bone marrow was normocellular, containing <5% blasts, >15% erythroid cells, and >25% normal granulocytes; 2) peripheral blood had neutrophils > 1.5 × 109/L, hemoglobin >11 gm/dl, and platelets > 1 × 1011/L; 3) no evidence of extramedullary leukemia, and 4) all of the above fulfilled for at least 4 weeks. Nonresponse to EMA-G induction was defined as the absence of CR after one course of induction therapy. Relapse was defined by the appearance of circulating blasts or bone marrow blasts >5% in a patient previously in complete remission. The method of Kaplan and Meier was used to analyze overall survival, relapse-free survival, time to neutrophil recovery and time to platelet recovery. Exact 95% confidence intervals (CI) based on the binomial distribution were calculated for proportions such as the complete response rate. From August 1994 to November 1996, 30 patients were enrolled onto this study. One patient received high-dose cytarabine instead of EMA-G for induction therapy after enrollment and was therefore excluded from further analysis. Thus, 29 patients received EMA-G induction therapy and are evaluable for treatment-related toxicity. Only 28 patients are evaluable for induction response since 1 patient was lost to follow-up shortly after receiving induction therapy (no evidence of persisting leukemia by the post-induction bone marrow biopsy). The characteristics of the evaluable patients are listed in Table 1. Twenty-eight patients had cytogenetic studies of bone marrow aspirates. Most patients (61%) had unfavorable karyotypes. The majority of patients (69%) had secondary AML transformed from either MDS (n = 10), CML (n = 5) or other myeloproliferative diseases (n = 4), or secondary to cytotoxic agents (n = 1). Overall, 15 patients with secondary, but untreated, AML were enrolled. Four patients were enrolled with AML refractory to previous induction therapy, and 10 were enrolled with relapsed AML. Characteristics of 29 patients with AML treated with EMA-G. The median time from the start of chemotherapy to recovery of an absolute neutrophil count exceeding 0.5 × 109/L was 30 days (range, 19 to 47 days). Three patients died of febrile neutropenia and sepsis during induction therapy. The median duration of platelet transfusion dependence was 30 days (range, 22 to 48 days). Twenty-eight patients are evaluable for treatment response. Thirteen patients (46%, 95% CI 27%–66%) achieved a complete remission. Seven of those 13 patients with CR had secondary leukemia. Twelve patients (43%) failed to achieve CR following induction treatment. One of the non-responders had no evidence of leukemia after induction treatment and proceeded to bone marrow transplant before meeting all of the criteria for complete remission. Three patients (10%) died during induction treatment. Of the 13 patients who achieved CR, 6 patients received further consolidation chemotherapy (3 with high dose cytarabine, and 3 with intermediate dose cytarabine combined with daunorubicin, etoposide, or interleukin-2), and 6 patients received either allogeneic BMT or allogeneic PSCT. One patient relapsed before any post-remission therapy was given. Of the 13 patients who did not achieve CR, 1 received salvage chemotherapy, 2 received allogeneic BMT, and 10 died due to rapid disease progression. The median overall survival (OS) for all evaluable patients is 9 months (range, 0.5–66 months). Median relapse free survival (RFS) for those who achieved CR is 3 months (range, 0.5–63 months) with 6 patients censored at allogeneic BMT or PSCT. At five-years of follow-up, 3 patients (11%) were still alive. Two of them were in CR, one of whom had allogeneic BMT and the other had high dose cytarabine as post-remission therapy. The third patient is alive with recurrent leukemia. All patients experienced fever in the setting of severe neutropenia. Fifteen (15%) patients had documented infections. Three patients (10%) died from febrile neutropenia and sepsis. Other WHO grades III-IV toxicity included mucositis (17%), diarrhea (17%), skin rash (14%), nausea and vomiting (14%), bleeding (3%). Ten (34%) patients had reversible hyperbilirubinemia and 5 (17%) had WHO grades III-IV renal insufficiency. Three (10%) patients experienced severe neurological toxicity (1 with seizure, 2 with severe vertigo) but those complications resolved shortly after the completion of induction therapy. GCSF was stopped in 1 patient due to persisting peripheral blasts. When G-CSF was discontinued the peripheral blasts cleared and the patient achieved a complete remission. Rather than use a standard high-dose cytarabine regimen we employed the EMA chemotherapy protocol devised by Archimbaud and colleagues. This regimen is effective in patients with relapsed and refractory AML with a reported CR rate of 60%. In addition EMA avoids the cerebellar neurotoxicity of high-dose cytarabine. Recognizing the potential value of hematopoietic growth factors, Archimbaud and colleagues added GM-CSF to the EMA regimen beginning on Day 4 of treatment. Unlike the current report, however, GM-CSF was discontinued on Day 10 of treatment. Unfortunately the addition of GM-CSF did not increase the CR rate when it was compared to placebo in a prospective randomized study in patients with relapsed and refractory AML. The results with EMA and EMA plus GM-CSF are compared with our own results in Table 2. Comparison of three clinical trials of EMA with and without the use of hematopoietic growth factors. The treatment of advanced high-risk AML patients remains challenging. The use of EMA-G in the current study failed to demonstrate a better CR rate than published data of EMA alone or EMA with GM-CSF (EMA-GM). However, the 46% CR rate achieved in our cohort of patients with a higher proportion of secondary AML and older median age suggests that the EMA-G regimen deserves further study in a population of patients with less advanced disease. X-YH collected and compiled the data and reviewed the manuscript with MK. PE participated in the design of the study, performed the statistical analysis and wrote the statistical section. MH, AL, BP, and SA conducted the study, contributed patients, and commented on the data analysis and manuscript. MK conceived of the study, reviewed the data collection and analytical processes, and wrote the body of the manuscript. All authors read and approved the final manuscript. acute myelogenous leukemia. G-CSF, granulocyte colony-stimulating Factor. GM-CSF, granulocyte-macrophage colony-stimulating Factor. EMA, etoposide, mitoxantrone and cytarabine. EMA-G, EMA and G-CSF. We thank the nurses and staff of H71 without whose aid we could not perfom our work.